This is the ultimate Personal Training Career boosting package. There won’t be a chance to learn so much while connecting with many and building your business. I will run this for four days and take it down as a package. It is going to transform your career and business and the content will stay with you for as long as you are in the industry (Mentorship 1/2/3 and Injury Rehab Specialist, as long as they continue as courses). You need to read below to really understand this deal in full by scrolling down, but here are the highlights. You are a Personal Trainer, you are struggling more than you want to. It feels like you work in a team, yet you are alone. The information going around online is so polar opposite, you are told to do an exercise one minute and then stop using it the next minute, sometimes on the same website. It gets worse, not only do you feel lonely in your team, undervalued and ready to move on, but you also know that the next gym will possibly be the same. Then your mate introduces you to this page, a page that will help you solve all aspects of a failing or boring Personal Training business. These products are not courses but have all the content of a course, these products are not really mentoring, yet retain the one to one expert knowledge and meetings, these products are not really networking, but you will get to meet and share with trainers around the world, bot in messenger and on live hangouts. – Weekly meetups on Zoom for business, anatomy, physiology, injury recovery, injury prevention, pain science, exercise creation, assessment building, social media strategy and more! – Community groups on Whatsapp and Facebook Messenger, plus on Hive Learning. These groups are supportive, funny, ego-free places that are lively and great for questions and support. – Social media content support, we will get the group to help pool talents for everything from creating content to delivering content, you won’t have to worry if you need an accent on a voice over, help with editing, help with an exercise that needs filming or any other problem we can pool together to solve. 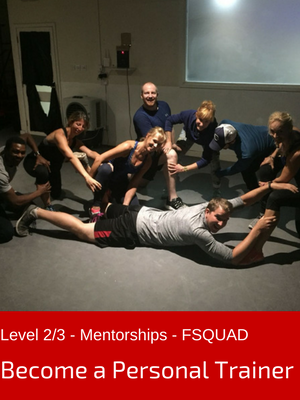 Additionally, you will get access to the #FSQUAD business group for 6 months. Combined this is worth – £3490!! When you pass your level 3 course, then you have to make the transition from student to expert. More than that though, you have to become an expert in a gym or an area of experts who probably have more experience than you. This can be disheartening, especially as you have to learn the job, meet new people, make sales, deliver training, teach classes (potentially) all while still finding your feet with the material. Additionally, you now have it harder than other generations of Personal Trainers, because you have to compete with and participate in social media. When you have joined an industry to help people and you get these new challenges, then you need more than a business plan or another 12 courses to complete. You need a mentor and a plan! In mentorship 1 you will get access to the course designed to help you through these first challenges. Our focus is to help you to develop a process of your own, that will help you to find clients, talk to them easily, help them achieve their goals (that they often hide from you and themselves), and to help teach them how to tell your story so they will refer more clients to your business. It is more than just a set of modules though, as you go through these tasks, using the online pre-recorded content, and the bi-weekly lessons you will start to grow as a Personal Trainer. Your eyes will be open to the tricks of the industry and you will start to build better more specific training programmes for your client. This will help them see results quicker and it will feel great as they send you texts full of pride and probably more clients. When you have been in the industry for a while and you know that you need something else, you want to work with a wider range of clients and you want to develop your own style. In order to do this you need to own your craft and then build further skills and techniques on top of that. This is the course that will drive home all the parts of the craft you will need to grow your business, client base and programming skills. We take this level to help you learn to develop an almost unlimited library of exercises (that you build), along with the ability to take a client accurately and then we link you to like-minded trainers who will help you build your business. This is going to be your way of feeling confident in what you do and how you do it, you will be able to own building content for your website, social media accounts and your classes will rock. More than that though, you will be fully confident with clients with any goal. We labelled this level Street Superhero because you will master the full range of techniques that the best trainers, trained elsewhere will have. At some point, you will reach the point, where being the best at the skills the others trainer have, is just not enough. Now is the time to find you. It is where you will need the craft to build on, the strategies that allow you to develop your own style and information and then the network to make sure you stay on top of your game, you have a collection of people who understand the process and are willing to support you with it. This would include sharing studies, helping with clients, sharing contacts and all the other benefits of being part of this collection of people. The superhero part of this course is found in the craft we share with you. After spending over 20+ years in the industry, helping trainers reach the top of their potential and our industry, the skills you will learn will accelerate your progress to help you achieve your goals in the industry. Module 1 – FASTER Process – How we find and filter research, building back from experience, the what and how they want it principle, how to identify and change emotion, skill development and performance development, building specific assessments and how we utilise biomechanics. Module 2 – Biomechanics – This is the section where we share the HMAC eyes. It is the ability to start to predict movement across bones, joints and muscles in all different kinds of movement. Taking the idea of a reaction from a movement from one or two bones and watching the predicted ripple through the body. Then it is a case of deconstructing this and showing why that will probably never happen. Module 3 – Brain and the Nervous System – We consider this the bedrock of the course, as the human body and its mechanical nature break down because we have a brain that responds to the nervous system. This section looks at sensations, interpretation of sensation and finally how this produces an emotional response. The effect of mood will then be played into this to help set up the rest of the course. Module 4 – Injury – This module re-caps injury, defining them and then showing how to find a body of evidence to support a treatment. Also, this is a section where we discuss recovery times and treatments to highlight how sham therapies make it into our world. Module 5 – Pain – Misunderstood by so many, in so many ways. In the biomedical model, it is about correcting the structure, in the Biopsychosocial model it is about the emotion related to sensation. The result is that we have a lot of techniques and little understanding of possibly the most asked about aspects of our work. During this module, we will look at the research, different kinds of pain and start to work on how to deliver solutions to our clients. Module 6 – Prediction and Prevention of Injury – Focussed on the injuries that are non-impact and often acute, this module is about finding ways of predicting and preventing clients from falling into pain. It is in this module we will use the best science for our answers and possibly rule out some well thought of techniques that are used because of convention rather than evidence. Module 7 – Skill Development – Skill is the descriptive term for having the sequencing of muscles to ensure that a client can perform a task. This sequence can be lost due to pain or injury and although that is useful initially as a way of protecting a client, these new movement sequences may in the end cause more issues. In this module, we assess techniques for improving and discovering skill (sometimes required if an injury causes a permanent change to a joint, bone or muscle). Module 8 – Performance Training – In this course, Performance, really means accurate utilisation of skill in the environments that the client will need to perform. This could be as small a task (for the abled body), as sitting in a chair, or as difficult a task as perfecting the golf swing. Performance Training and techniques to improve it become extremely important when it someone is recovering from an injury due to the fact that they have to find ways of completing tasks while suffering pain or weakness. Module 9 – Exercise Creation – Whatever you currently do with clients regarding exercise selection, this module will open the door to creating an almost unlimited amount of alternative exercises, progressions and regressions. We use a system called the exercise generator, which taps into a system of being accurate yet creative with exercise design. In this module, we also explore how to evaluate and use any training tool available on the market. Module 10 – Communication – To steal a term from legendary improviser, Dave Razowsky, this is about tissue level listening. Meaning that in communication, you have the ability to change emotion with a client, and so the accuracy of your delivery has to be on the mark. Here we look at different points of view that will allow you to deliver a consistent message through your marketing, and in person delivery. This is the first stage of building an experience-based programme and also the most powerful of the modules in our experience training Therapists so far. Module 11 – Assessment – With the information you have at this point, the need for a client and clinic/therapist specific assessment will be vital. In this module, we show how to build a scientifically and client-focused assessment for all clients that require one. Working from interview to a biomechanical assessment. Module 12 – Experiential Exercise Design – Brining everything in the course together, this is about the way a set of exercises are laid out in order to create a story like experience. In this system, it is possible to build a change in emotion within the client, which as we will have discovered, everything to a client in pain. This is our business community, which we give to you for 12 months when you have completed your level 2/3 course. #FSQUAD is the place to go to find content on how to run your business, find a route for your career, get to more clients, convert more clients and more. #FSQUAD is on version 2, which launches in September 2018 and is built around live hangouts where we use Q&A as well specific lectures and guests to help you not only run your business but also to grow it to allow you to have the life you want. Bi-weekly online meeting/call to develop skills and share experience. In order to solve the problem of being known as a professional, organised and able to work with clients easily, we now have a system to help you. Using our brand as a way of helping you have credibility through association to the community of trainers, and by working on SEO for your specific page, we are building a trainer register that is free and focussed on finding you, new clients. When we find a client we take no fee or commission either, these will be your clients! Plus loads more features to make you stand out against your competition. You may also use the Powered by FASTER logo and link to your page on our website.